Teaching Associate (Food and Beverage Service) - 3 Posts - 18000 pm consolidated pay - Full time UG and PG Hospitality and Hotel Administration / Hotel Management with 60% marks or Full time UG Hospitality and Hotel Administration / Hotel Management with 60% marks and 2 years exp - Age 30 years - by contract basis. 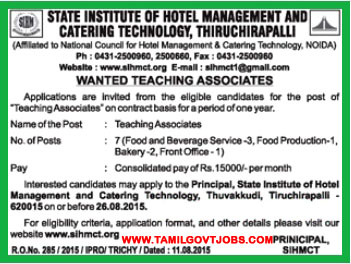 Teaching Associate (Food Production) - 1 Post - 18000 pm consolidated pay - Full time UG and PG Hospitality and Hotel Administration / Hotel Management with 60% marks or Full time UG Hospitality and Hotel Administration / Hotel Management with 60% marks and 2 years exp - Age 30 years - by contract basis. Teaching Associate (Bakery and Confectionery) - 2 Posts - 18000 pm consolidated pay - Full time UG and PG Hospitality and Hotel Administration / Hotel Management with 60% marks or Full time UG Hospitality and Hotel Administration / Hotel Management with 60% marks and 2 years exp - Age 30 years - by contract basis. Teaching Associate (Front Office) - 2 Posts - 18000 pm consolidated pay - Full time UG and PG Hospitality and Hotel Administration / Hotel Management with 60% marks or Full time UG Hospitality and Hotel Administration / Hotel Management with 60% marks and 2 years exp - Age 30 years - by contract basis. The above recruitment of teaching associates are purely contract basis appointment. Send you application by Speed Post only.